The Borge Bracers are an intriguing part of any warriors defense, offering not only superb protection but also a distinctive design, one with a subtle sort of visual enhancement to any warriors preferred look or chosen style. Being crafted entirely from 9-10 oz. 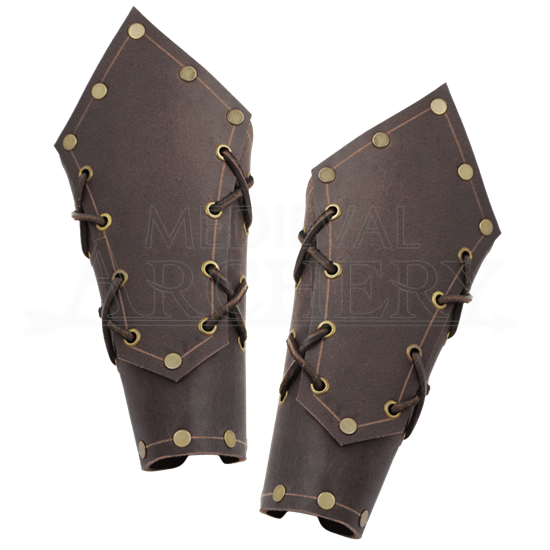 leather, these bracers have a rigid form that has just enough flex to encompass the arm, ensuring that when worn, they offer more than enough protection to deflect LARP blades and weapons with ease. The unique design of the bracer is double-layered on the front, featuring a vague, diamond-shaped plate with rivets along its upper and lower edge, as well as laces that run along the plates long sides. Crisscrossed through these laces are X-shaped ties, which serve as secondary decoration, which gives the bracers a unique appearance that very little can match. The bracers are sold as a matched pair and are offered in only one adjustable size, and they are worn via lace-up ties along the back. The unique character of these Borge Leather Bracers makes them a stellar way to draw some attention to your warrior look and style, while the quality make means that you do not have to sacrifice personal appeal for quality protection.